When many of us think of airlines we think of long security lines and publicly traded companies with fleets of hundreds of jumbo jets. While we do have the ability to accommodate large airline promotional products orders, it's important not to forget the arena of private aviation because that is a segment that strives to provide the pinnacle of luxury and service to their clients. We grew up around various aviation professionals, with family and friends being professional pilots on both sides of the industry. 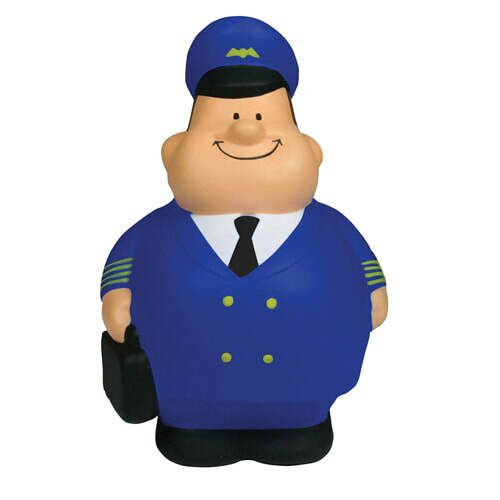 Below you will find some of our favorite promotional products for airlines, or visit AdSpecialtyProductsCatalog.com to do your own specific search. Let's be honest, what flight enthusiast is not going to want to keep an airplane business card holder on their desk with your logo? 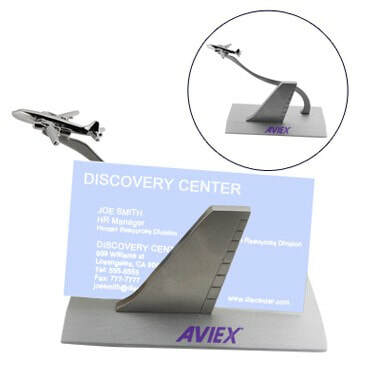 The pilots and enthusiasts that we know tend to keep every flight themed gift that they receive, and these custom logo airplane business card holders are among the coolest, with their wing and airplane design to complement your engraved or printed company logo. These metal desktop business card holders are substantial and can double as a paperweight. At just under $13, these wing business card holders are priced perfectly to be your next executive gift. When was the last time you received ANY flying or throw-able item and not immediately assemble it and give it a try? Our custom printed paper airplane kits are absolutely irresistible to both kids and adults, and at a price as low as $0.27 ea. at 50k quantity, this could be exactly what you need to deliver your next mass-quantity message or mailing. Pilots work difficult schedules and make great personal sacrifices to perform the job that they love. 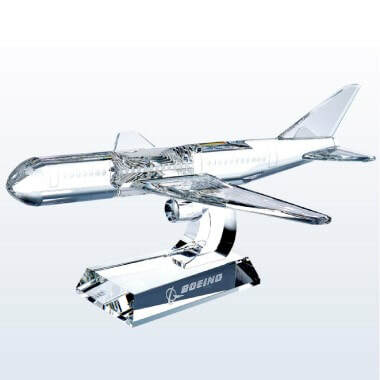 Our crystal airplane awards can be sandblasted with a logo to recognize everything from aviation achievements to new product launches or promotions. These are the best crystal airplane awards in the business, and are available in different sizes. The largest one ranges from $296-$356 depending on order quantity. One of the challenges on a day to day basis in the aviation and aerospace businesses is finding reliable pens that can deal with writing in a constantly changing environment. These Down Force pressurized ink pens are very attractive, available with your logo, and can write smoothly even while your co-pilot is doing barrel rolls. This next pen is geared more toward younger folks, but let's face it, if you receive one of these as a gift you know you will keep it. These customized airplane pens would normally be cool as is, with or without a logo. BUT- when you take a minute to really test this marvel of aviation technology, you realize...that it has FOLDING WINGS. That's right- a customized logo airplane pen with folding wings for under $2 each. You're welcome.